What staples are on your holiday table? From Italian to Pakistani, these are some of the international dishes registered dietitians and nutritionists are serving right here at home. Think of the foods that typically grace your holiday table. What comes to mind? The traditional holiday dinner is often portrayed as a roast bird with all the fixings, but that’s not necessarily the case for many Americans. The United States is a melting pot of ethnicities, and the dishes served at many holiday tables reflect these diverse backgrounds. I spoke with several foodies who are either immigrants or have strong cultural ties, and they shared the assortment of international foods that take center stage at their holiday feasts. As a child, I thought everyone celebrated Christmas with antipasto, lasagna and meatballs. It wasn’t until I reached adulthood that I realized the uniqueness of this situation. My paternal great grandparents emigrated from Italy, and their food customs have been passed down through the years. My holiday meal starts with an antipasto platter, which displays the produce grown in the warm Mediterranean region, such as olives, tomatoes, artichokes and peppers. Christmas dinner always includes some form of pasta, usually lasagna. It’s well known that pasta is part of the Italian culture, and the word “pasta” literally translates to paste, referring to the actual dough. Meatballs, which are often considered a peasant food in Italy, accompany the pasta dishes. This staple has become popular in the US because it was something that Italian immigrants could replicate in American with very little money. Try it: As a vegetarian I don’t eat meatballs, which is why I created my own meatless version. Even the meat eaters at the table enjoy this healthier alternative. Many of the islands in the English-speaking Caribbean, like Trinidad and Tobago, have major influences from a variety of cultures, including the indigenous Carib and Arawak peoples, India, Africa, China, Spain and the UK. Today, the people and culture of the islands continue to represent the past. “I am a first generation Afro-Caribbean American and both of my parents immigrated here in the late 60's,” says New-York based registered dietitian, Maya Feller, RD. “What I love most about food from Trinidad and Tobago is the flavors; the dishes are marked by the use of spice while playing with temperature and texture in dishes,” Feller adds. Feller describes memories of her grandmother making pastelles, a corn-based dough filled with minced meat and olives, as well as pelau, a one pot rice dish with pigeon peas, veggies and chicken derived from the Indian descendants of the island. One of the most popular dishes to be served at a “lime” — otherwise known as a gathering — is callaloo, originated from African and Carib cultures. “I would describe callaloo as a soft earthy food, made from okra and leafy greens [as well as spices and coconut milk]”, says Feller. The callaloo is usually served with corn meal coo coo, a savory, thick and creamy spiced version of polenta. Try it: Feller suggests switching up the traditional greens at your holiday table for callaloo. Jewish Americans come from a variety of regions all over the world, yet they share many similar food practices. Registered dietitian Lauren Harris-Pincus, RDN, author of "The Protein-Packed Breakfast Club" is one of the many Americans who celebrates Jewish holidays. “At Hanukkah, the common ingredient is oil, since we are celebrating a miracle that happened when Jews had only enough oil to burn the light in their temple for one day and it lasted eight days,” says Harris-Pincus. With that oil, Jews traditionally make potato latkes and jelly donuts. Another common holiday dish is brisket, which is believed to have become a popular Jewish staple because it’s a kosher cut of meat from the front of the animal. “My great grandma was born in Hungary and paprika is the dominant spice in many of our family recipes, like paprika chicken,” adds Harris-Pincus. Try it: As a registered dietitian, Harris-Pincus lightens up the traditional holiday cuisine with a cauliflower latke and her rendition of Paprika Chicken. “While most Jewish dishes historically contain chicken fat, we have adapted recipes to include healthier fats like olive or other liquid oils,” she says. Mascha Davis, MPH, RD, a private practice dietitian, immigrated to the US from the Ukraine as a political refugee when she was 7 years old. “After arriving in the United States, my family continued to eat traditional Ukrainian and Russian foods, especially during the holidays,” says Davis. The majority of traditional Ukrainian foods represent the climate and diet of the peasants. Root vegetables, like beets and potatoes, are the primary components of many dishes, as well as other foods like mushrooms and cabbage. Probably the most well known dish is borscht, a vegetable soup with beets, potato and cabbage. Davis also describes other popular meals, like holubtsi-stuffed cabbage rolls — and her favorite, "seledka pod shuboi." “It literally translates to 'herring under a fur coat,' which makes all my American friends giggle,” says Davis. Try it: It doesn’t need to be the holidays to whip up a simple borscht soup, but this vibrant dish will definitely add color to your holiday table. “As a country on the Mediterranean, Syria's cuisine includes plenty of fresh fruits and vegetables, whole grains, nuts, beans, lentils, dairy, fish, olives and olive oil,” says Rahaf Al Bochi, RD, LD, owner of Olive Tree Nutrition and spokesperson for the Academy of Nutrition and Dietetics. Al Bochi was raised in America, but it was important to her Syrian family that she learned how to cook their traditional meals. Above all else, one of the predominant foods in Middle Eastern celebration is anything sweet. “During the holidays we make traditional sweets such as maamoul, which are date and pistachio filled pastries, baklava and rice pudding,” says Al Bochi. The reason for this dedication to desserts is not entirely understood, but it sounds delectable. “Main meals always include a lamb dish with a rice or freekeh,” (a wheat grown in the Middle East). Try it: Many suggest leaving the sweet making to the professionals and heading to the bakery to try some of these delicacies. Something you can make at home, however, is authentic Syrian freekeh. Pakistani cuisine is a blend of foods from the Indian subcontinent and Central Asia. “Spices, like cumin, carom seeds, turmeric, garam masala, cardamom and saffron, are a huge part of South Asian cuisine,” says Shahzadi Devje, RD, owner of Desi~licious RD. “As a Pakistani Muslim, my holiday table always contains some sort of curry, such as chicken or lentils (daal),” she adds. Devje notes that ethnic vegetables, like bhindi (okra) and baingan (eggplant), are usually cooked in tomato-based sauces with traditional spices and served with traditional breads, called chapati, paratha or naan. 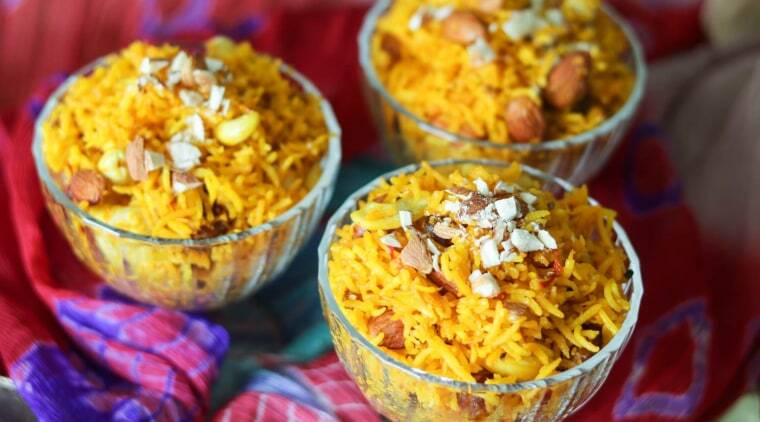 “No South Asian feast is complete without a biryani, a traditional mixed rice dish, or zarda, a sweet yellow rice with nuts and dried fruits,” says Devje. Try it: Try Devje’s version of chicken and lentil curry, known as chicken dhansak, or the traditional sweet rice, zarda.